After four days of quite ridiculous overeating in Canada (involving at least two multi-course meals every day) it was good to be home again. Although it’s exciting, flashy restaurant food palls after a while so it was lovely to eat a dish as straightforward as penne with a simple tomato sauce and a green salad tonight. I don’t know why we don’t value such dishes more. The Italians are certainly happy enough with them but we (and I include myself in this generalisation) too often seem to feel the need to fiddle about with recipes that are best left alone. And the more ingredients you add, of course, the more a dish costs. Staggering off to bed shortly. Even though my body clock tells me it's only 4.40 pm I've been up by Canadian time since 2 am this morning, having slept a bare 3 hours on the plane. There's a price to be paid for all that fun . . .
My weekend visit to the butcher (the one who was down in the dumps) yielded a wild rabbit which I decided to turn into the great French bistro dish Lapin à la moutarde. There are two ways of making it - smothering the pieces with mustard then roasting them or cooking them in stock then adding the mustard - and cream if using - at the end, a technique favoured in my battered copy of Poor Cook. I'm off on my travels again tomorrow, this time to Toronto (my first visit to Canada) so probably won't post again till the middle of next week. Unless I find some bargain maple syrup . . .
My visit to the farmers' market this morning has left me feeling quite depressed. Apart from one stall whose produce is always snapped up the moment they start trading there are signs that producers are struggling. Independent shops too. The nearby organic butcher admitted sales were down and that the farm from which his meat comes had had to lay off workers. But a new Italian-style café nearby was buzzing with people out for breakfast and brunch. What to make of it all? Obviously some people have money but don't choose to spend it on organic food - or even on cooking from scratch. If half of the local food producers go to the wall I don't honestly think they would very much care. There's a new Waitrose down the road so what's the problem? It's the people who have bought into the organic and local movement over the last 10 years that I'm more concerned about. They surely did so for a reason - healthier food for their families and/or supporting small producers to ensure a diverse local food culture. Now that times are hard surely these things are just as important? Even if you buy slightly less often or spend less when you do, it makes a difference. Small producers don't always do themselves a favour, true. Being small and farming organically doesn't necessarily mean you produce quality food. Pricing is sometimes ridiculous (some artisanal cheeses cost more per kilo than fillet steak) Few seem to use any imagination about the way they present and market their goods - offering deals to tempt their customers into buying more but the main problem seems to be that their case is going by default. The Fairtrade Foundation has done a fantastic job of making us more conscious of the value of supporting third world producers but someone needs to do a similar job for our homegrown ones or very few of them will survive the current downturn. And those of us who do still buy from them should be prepared to put our heads above the parapet and say how important it is, even at the risk of jibes about being elitist. If it was worth paying extra to feed our families healthy food a year ago, it still is now, even if we have to give up something else to do it. Is this a fair analysis? Let me know what you think. Are you finding your local food shops are struggling? Have you cut down the amount you spend on food from small producers? Do you feel you can afford to pay the prices they charge? Do we owe them a living or should market forces prevail? We had friends round to supper last night, two of whom were chefs which sounds a bit daunting. What I've learnt over the years though is that they're the easiest people to please. For a start they never get invited out as everyone is terrified of messing up and what they really like to eat is simple home-cooked food. As it's St Patrick's Day today (a happy one to you all!) I thought I'd make boiled bacon. This in itself was a bit of an epic struggle - you can't find a bacon joint for love or money other than one of those odd cylindrical moulded ham joints which oddly cost about twice the price of a piece of pork. In the end I tracked one down at my local butchers which was bigger than I needed but I reckoned we could probably live off the leftovers for the rest of the week. Having soaked it overnight I put it in a pan with an onion, carrot and bayleaf, brought it slowly to the boil then cooked it in the bottom oven of the Aga for about 6 hours. (I could easily have done this at a low temperature in a conventional oven or used a slow cooker which is great for boiled meats) I then used some of the stock to cook off some carrots, turnips and leeks which I laid over the other veg to semi-steam them so they didn't go soggy. Then I returned the water in which I'd cooked the veg to the main pan. Finally I rested the meat and warmed up the veg in the broth then cut the meat up in chunks and laid it and the vegetables on a huge platter, scattered over some chopped flat-leaf parsley and ladled over some of the broth (serving the rest in a jug alongside). To keep the Irish theme going we also had colcannon (mashed potato with spring greens) but some plain boiled potatoes would have been just as good. We had smoked salmon to start and Irish cheese*, oatcakes and fruit to follow and though I say it myself it was a feast. * Well, not as Irish as I'd have liked. I managed to find some Cashel Blue but the local cheese shops didn't have any other Irish cheeses which was a bit perverse of them the day before St Patrick's Day. The others were White Nancy (a local goats' cheese) and a sheeps cheese called Berkswell. It's been a while since I tried a new recipe - as opposed to inventing my own - but when I saw Ahdaf Soueif's recipe for koshari in the G2 recipe swap in the Guardian the other day I was immediately intrigued. 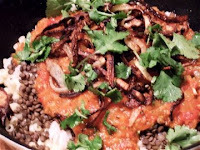 I'd recently got some feedback from the visitors to my student website beyondbakedbeans.com that they wanted some more lentil recipes and thought it would fit the bill perfectly. In fact I changed it quite a bit. I didn't have any vermicelli and thought it would be hard for students to find so I left it out. I used ordinary long grain rice instead of Egyptian rice (brown rice would be good I think too). I used canned tomatoes instead of fresh ones and slightly more of them than the recipe recommended and left out the tomato concentrate. I mixed the lime and garlic 'takhdi'ab' sauce with the tomato sauce as I thought it was more appealing that way. And I added fresh coriander both for the taste and the final appearance. When I was writing it up for the website I also changed the running order of the instructions to make it easier to follow and ensure that everything ended up hot at the same time. If - or, rather when I make it again, as I loved it, I'll reduce the amount of lime a little to the amount I've suggested in my version of the recipe and maybe also add some toasted pinenuts. You could also serve it with a bowl of yoghurt (soy, if you wanted to keep it vegan) or some sautéed or steamed cauliflower or broccoli. Harking back to the conversation we had a few weeks ago about whether to follow recipes or not this is very much how I would tackle a recipe these days. Not that I would claim in any way it's an improvement on the original but it's how I like it. Do try it and put your own spin on it. It really ticks all the boxes. It's unusual, tasty, frugal (a great way of using up odds and ends of pasta packets), nutritious and a great communal dish to cook for vegetarian and vegan friends. What's not to like? I decided to make a risotto last night to use up the chicken stock and a few leftover bits of chicken. As already reported the stock had (accidentally) been in the Aga simmering oven for 40 hours so the risotto needed to be an intensely flavoured one. I added a few mushrooms but, more importantly, a teaspoon of poudre de ceps, a magic ingredient I bought at a French service station a year or so ago. It wasn’t that expensive - about 5 or 6 euros but makes ordinary mushrooms taste like ceps. You can buy a similar product in the UK with the appalling name of Shake-O-Cini. The recipe, which tastes considerably more appetising than the rather murky picture above might suggest, is below but one tip. When you’re making a risotto with cooked chicken don’t add it at the beginning or it’ll go squelchy (to use a technical cooking term). I find it better to fry it up separately with the mushrooms then add it a minute or two from the end of the risotto cooking time. While you're doing this heat the oil and remaining butter in a frying pan and fry the chicken for a couple of minutes then add the sliced mushrooms and cook over a low heat until they begin to colour. 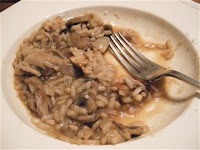 Tip the chicken and mushrooms into the risotto with the last addition of stock and heat through. Turn the heat off then add cep or porcini powder, parmesan and salt and pepper to taste. Cover the pan and let the flavours amalgamate for 2-3 minutes then spoon the risotto into warm bowls. Decorate with a few fine shavings of parmesan. I thought there would be just an inch or two of liquid left and that the pan would be totally destroyed but not at all. What I found was an unbelievably concentrated dark stock, almost more like a veal stock than a chicken one. It was too strong for the delicate vegetable soup I was planning for today's lunch however so I had to change tack and rustle up a different kind of soup from what we had in the fridge, freezer and storecupboard. I sweated off an onion, added a large clove of garlic, stirred in a couple of teaspoons of mixed cumin and coriander then added just under a litre of stock. In went 125g of Puy Lentils which I cooked until they were just done then the chopped remains of a pack of frozen broccoli* I tested out for the site a while ago - along with a handful of fresh basil leaves (I'd have used coriander instead if I'd had some). I resisted the temptation to blitz the lot in the blender which would have turned it into an unappealing pond-like sludge and fried up a few slices of leftover chorizo and some more basil leaves to garnish what was by now more of a stew than a soup. But it was very tasty and perfectly suited to this odd, cold sunny/showery spring day. There's even enough left for tomorrow - though no more chorizo so I'll have to add a bit of bacon. Oh, and a final drizzle of olive oil à la caldo verde is good too. * Spinach would have been even better if I'd had some. Some of the best recipes - if you can call this a recipe - happen by accident. I was cooking up some Bramley apples yesterday for our morning fruit compote (sounds so much sexier than stewed fruit) and chucked in a quarter of a lemon that happened to be lying around. I left it in the pan while the apples cooled then, when I found that it had an interestingly lemony zing, left it in the bowl in which I refrigerated them. When we ate the compote this morning it had a lovely bitter lemon edge that went perfectly with the dollop of yoghurt and honey we drizzled on top. I've also found a good way of using up the apple peel which is to add it and any leftover lemon shells you've discarded after juicing. You simply cover them with cold water, bring them to the boil and simmer for 20 minutes or so then strain and cool the cooking liquid. Result: a very natural-tasting and delicious apple lemonade that tastes every bit as good as those expensive top-end soft drinks. It's Frugal Friday . . . The site that heads the list is the excellent Irish blog cheapeats.ie which you should take a look at. There was a great post yesterday on what to do with turkey legs, something which I confess has always eluded me. Remember a time - not so long ago - when the standard advice on how to save money on fruit and veg was to buy them loose? And that the best bargains were on the bottom shelf? I've trotted those tips out myself more times than I care to mention but have to tell you now they're out of date. Pre-packed veg can be cheaper than loose ones. The best bargains can be at eye-level. Here's an example from Somerfield just now. Loose potatoes, sold down on the bottom shelf are £1.65 a kilo or 75p a lb. (That's not new potatoes which are £2 a kilo) If you buy a pack of four, which I'm guessing would come to about 800g, they're only 90p. 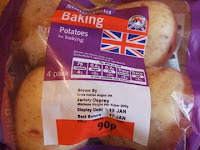 Even organic potatoes, sold at eye-level at £1.03 a kilo, are cheaper. How on earth does this make sense? Well, for what it's worth, my hypothesis is this. Potatoes are a staple - people don't have to be encouraged to buy them. Supermarkets (or rather their suppliers) are taking a hit on the special offers they're doing so they need to make it up somewhere else. They want a minimum spend on lines like potatoes so they want to encourage you to buy a pack rather than the amount you actually need. None of which is good news for pensioners and other people on a budget who are living on their own but since when have the supermarkets cared about them? You will almost certainly find potatoes - and other veg - more cheaply if you go to a street market, greengrocer or farm shop but if you're buying them in supermarkets be on your guard!